Today, I went to the store to get containers and potting soil. 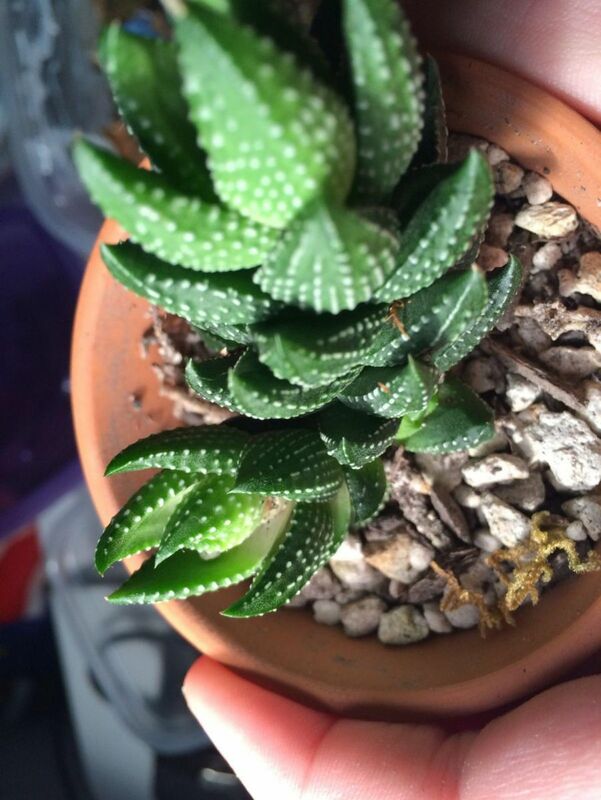 I ended up buying a small succulent plant along with those two! I got home and quickly put the plant next to my window. It's getting light right now. It's right next to my 5 other terrariums, in bottles, light bulbs, and containers. I now have 3 new containers with potting soil. 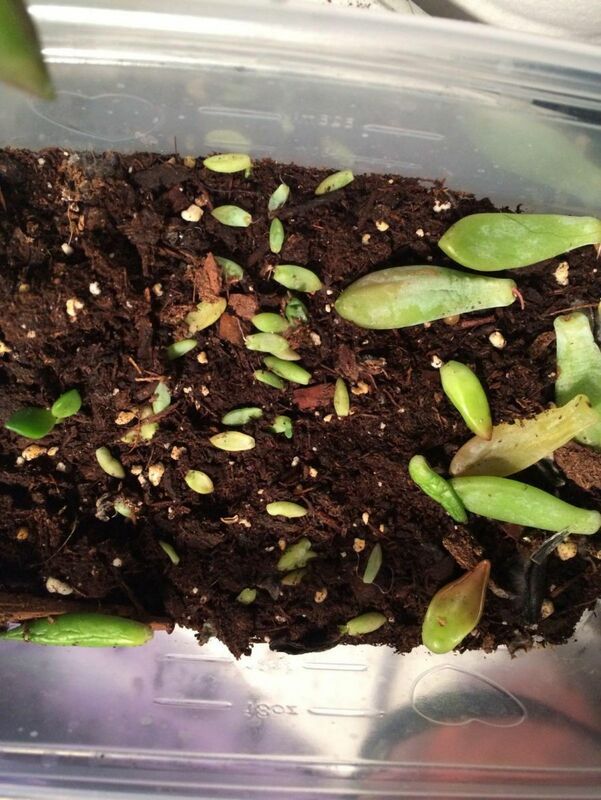 One of them has isopods and 2 species of succulent plants that I am trying to propagate. 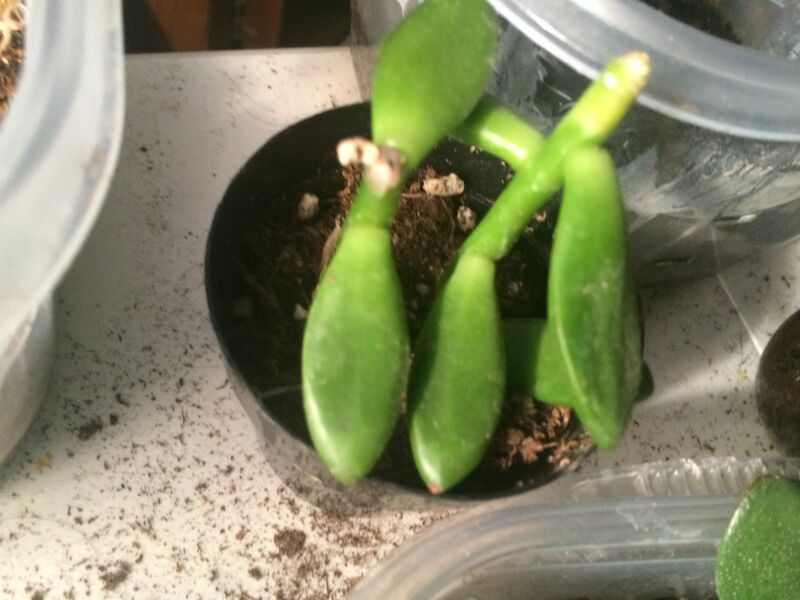 The other ones both have succulents in them that again, I am attempting to propagate. 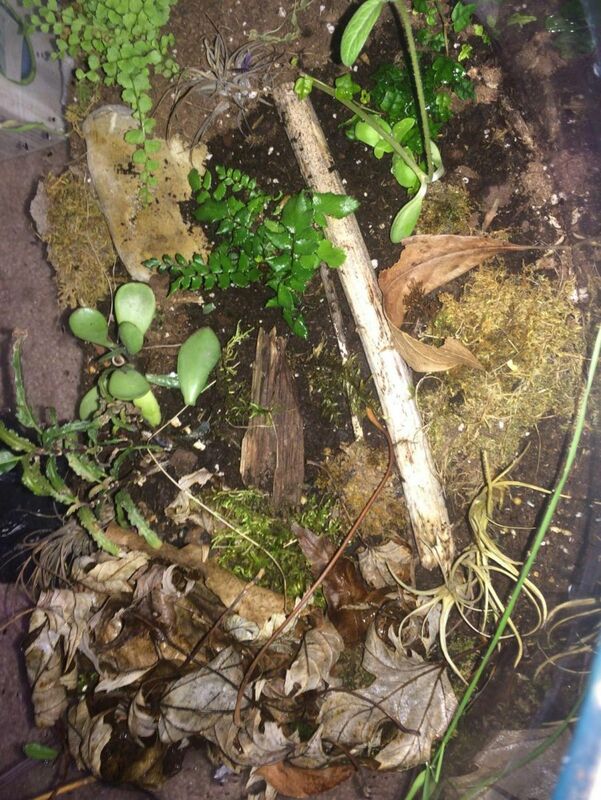 The terrarium I made about 1 or 2 months ago is very interesting, with a few plugs of moss, 2 small unidentified plants, and a species of grass. 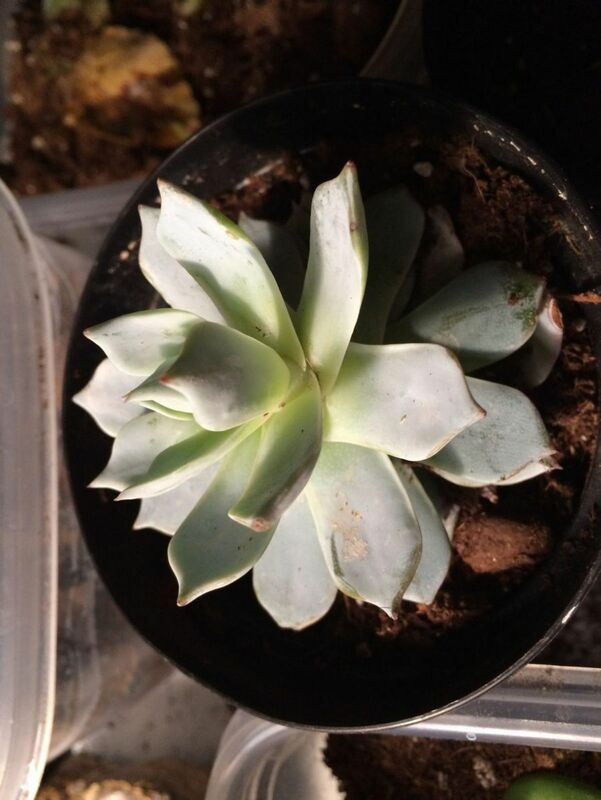 There also is what I suspect to be a different species of succulent. Pictures will come soon! I will update this journal when something interesting happens. Edited by AnthonyP163, July 30 2018 - 10:51 AM. It's been a while since I've updated this journal. I have gone absolute;y crazy with my plants, and now have a whole table for them! 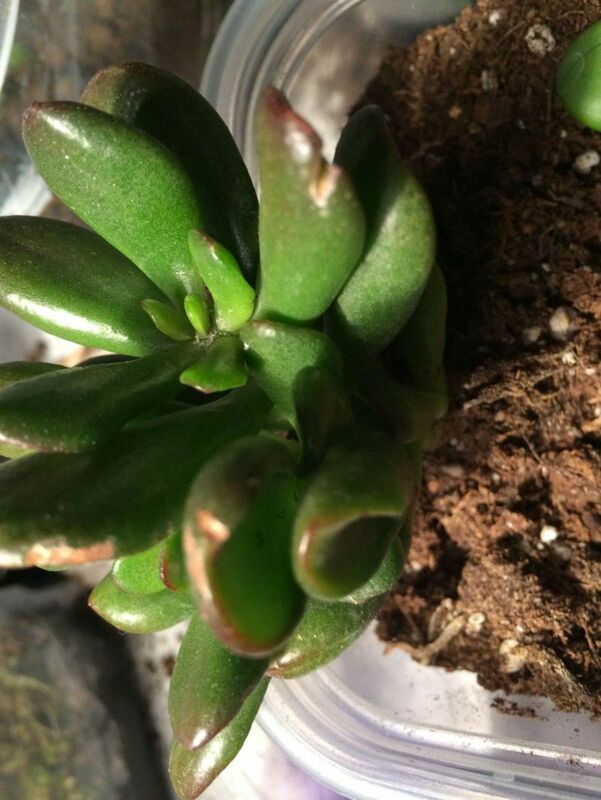 I have over a dozen succulents, and multiple small or large terrariums. 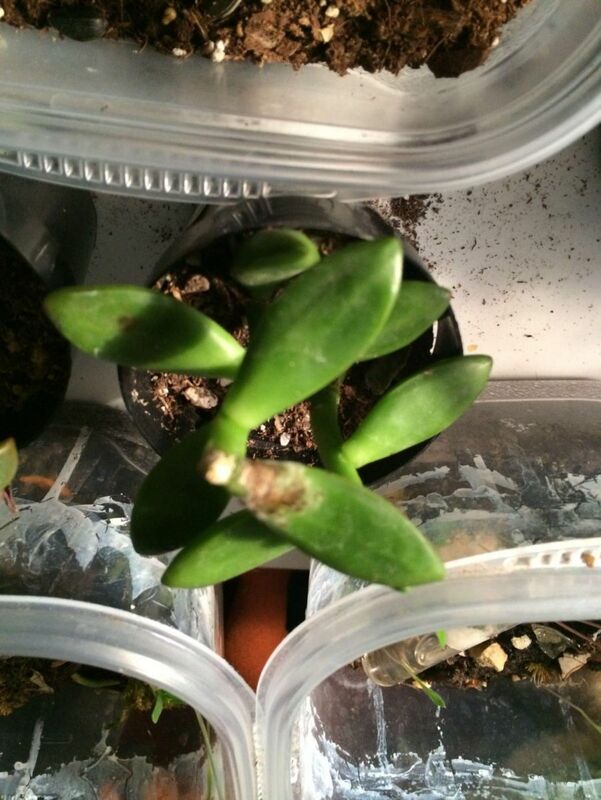 I even have a lot of succulent propagations going on at the time, and I will update you on those. 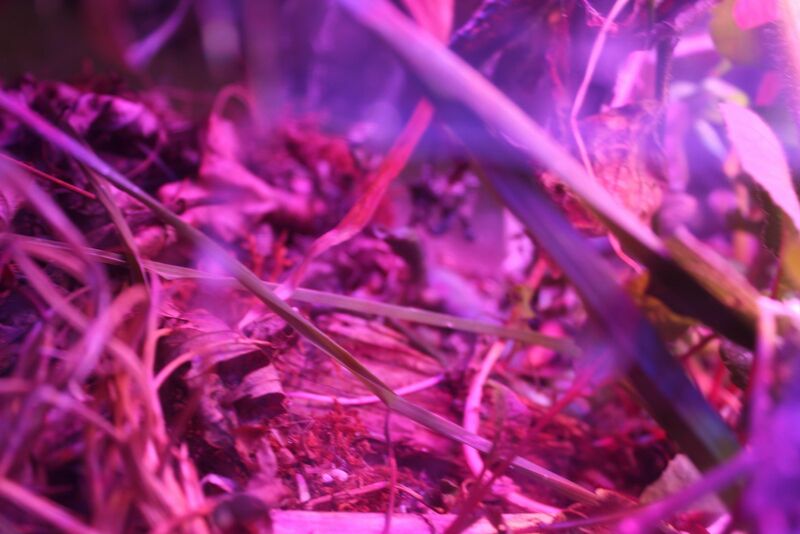 These pictures are from my Tetramorium natural setup. This colony has around 50-75 workers and a lot of larvae and pupae. These, of course, were not all of my setups and plants, but I have so many that I don't know if it would even work to upload them all! I'll try to update this more regularly. 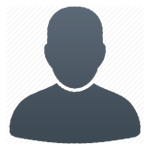 Hi all. It's been a little while since I've updated this, and a bit has changed. 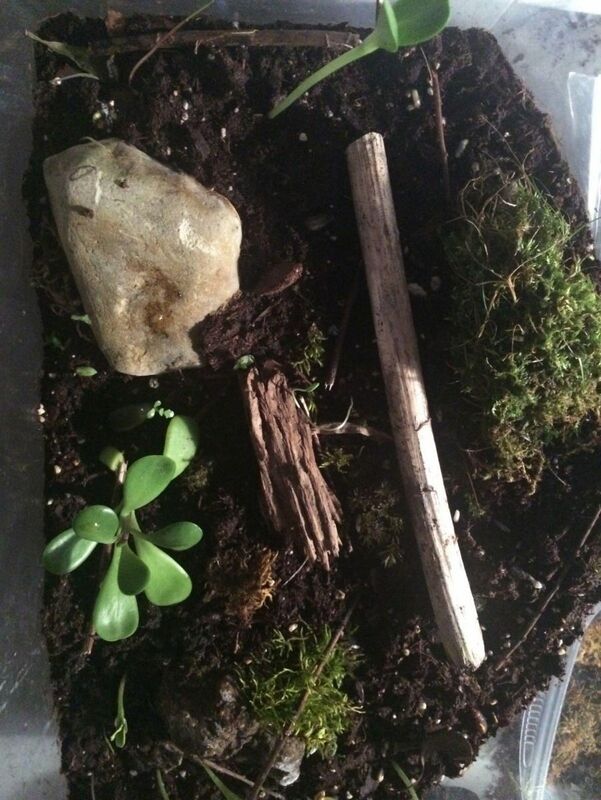 This is a 1 foot by 6 inch vivarium with a lasius queen in founding, and a small Formica colony. 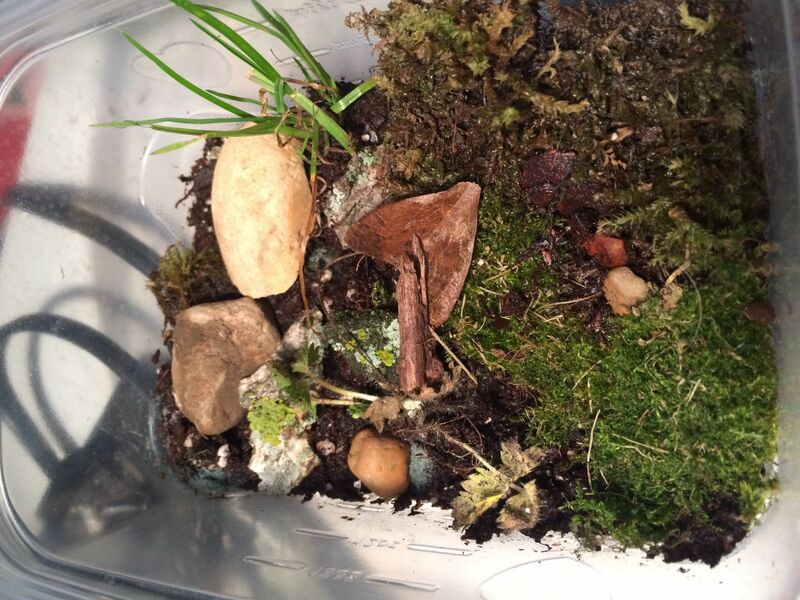 It has lots of plants, springtails, isopods, and centipedes. Here's a blurry picture of a Formica worker running around. 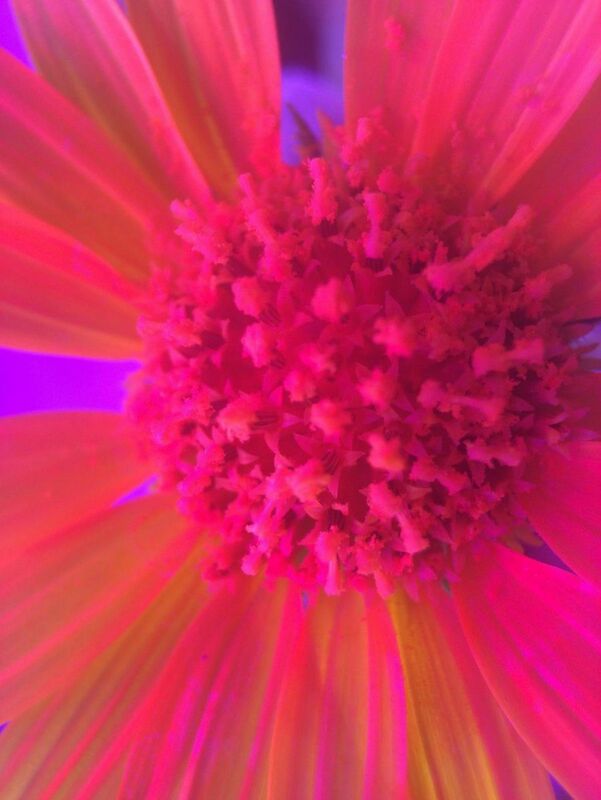 And one of the plants. 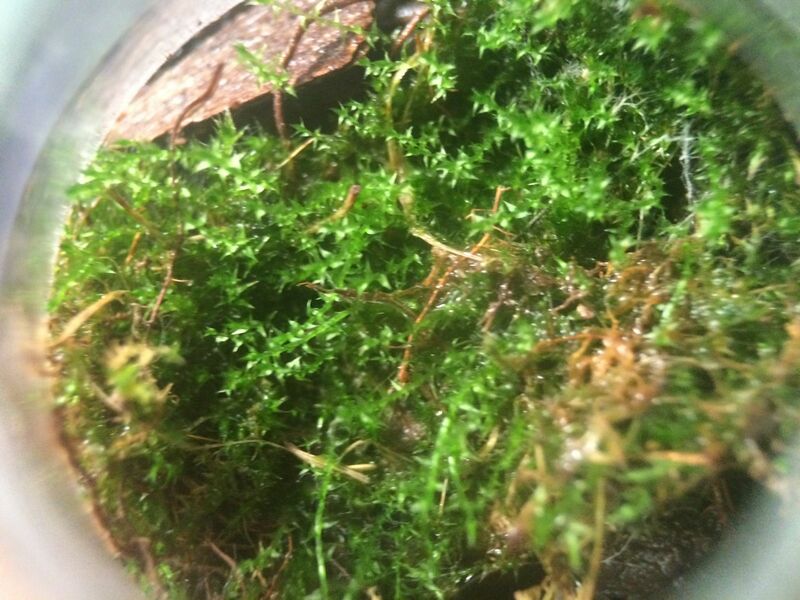 Heres some really pretty moss that I have in a lightbulb. 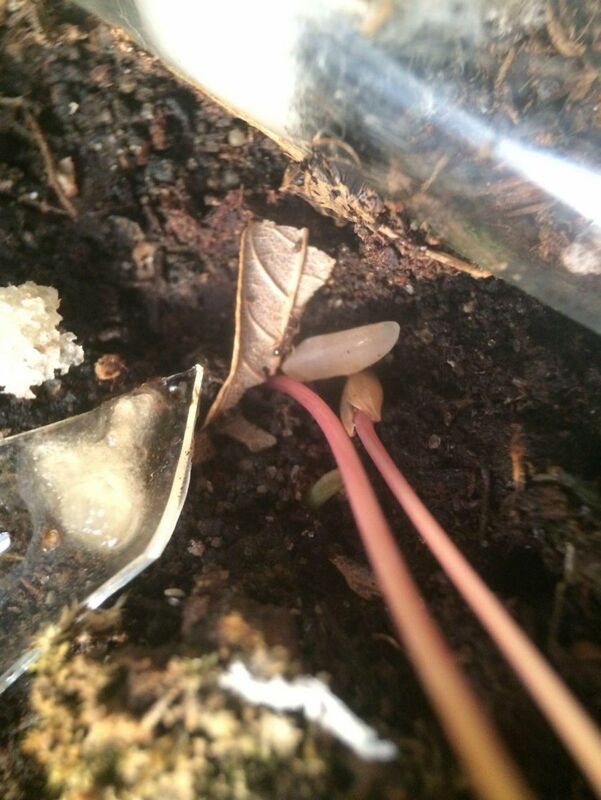 Here's a plant from my Tetramorium immigrans natural setup. 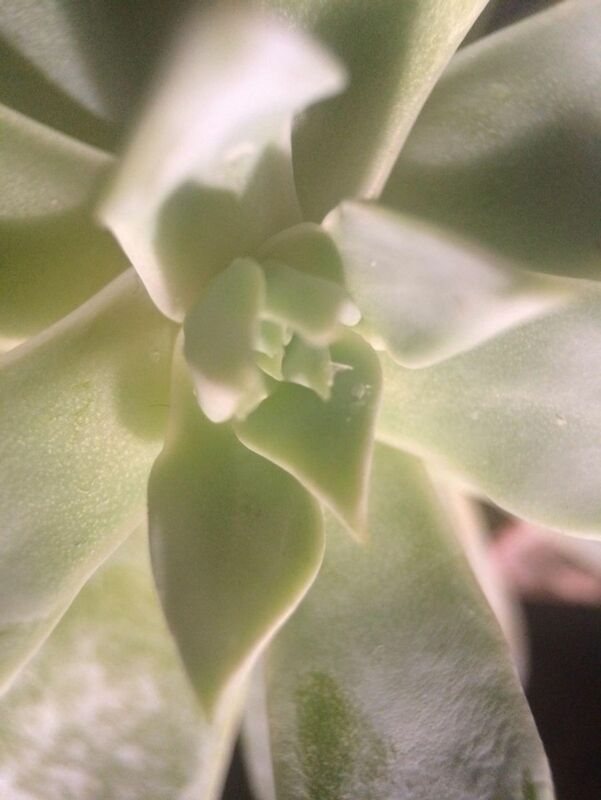 Here's a cool photo of some new leaves growing on my succulent. 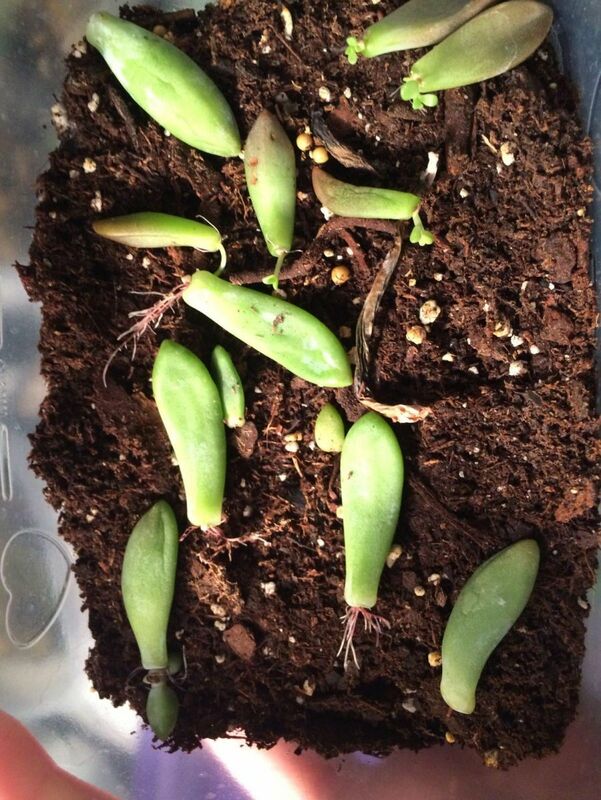 and here are some of my propagations. I'll make sure to do a larger update next time. I also will probably have a much better camera than a clip on macro lens after Christmas! Noice! Definitely gonna follow this. 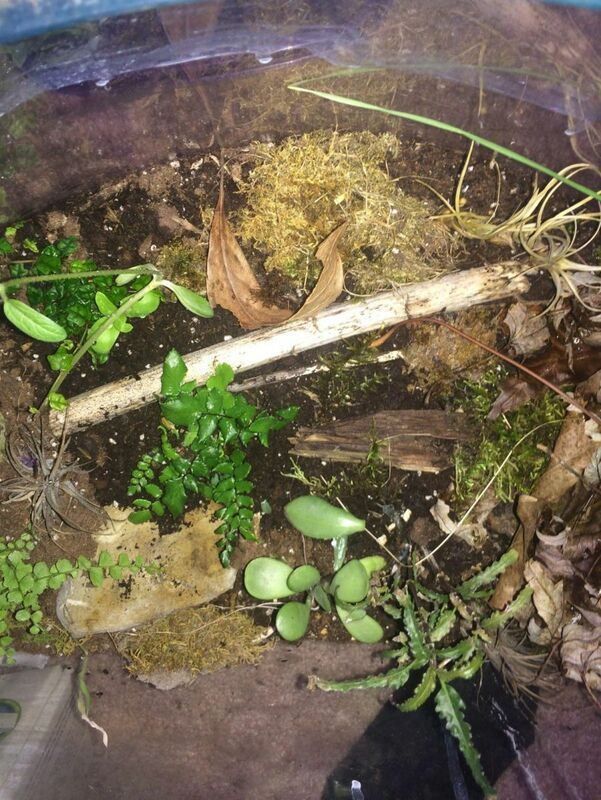 I also have a realistic insect based terrarium. 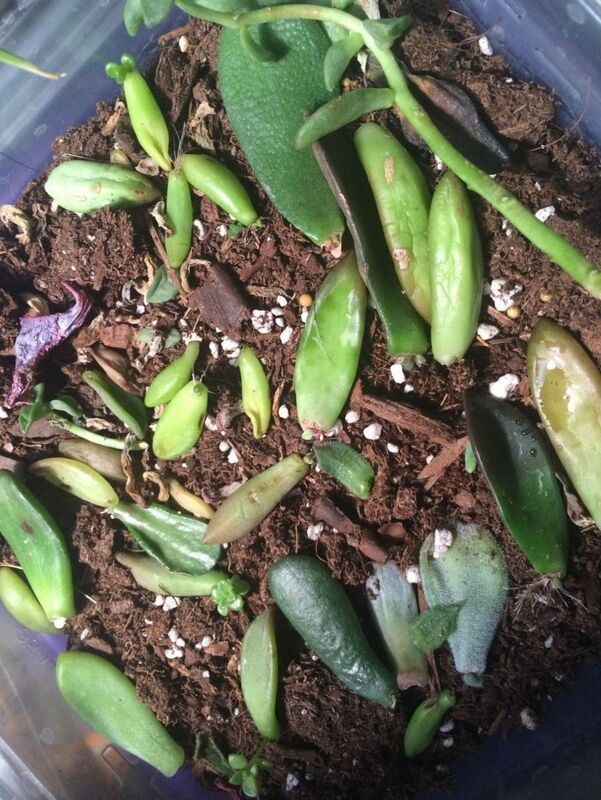 This update will mainly be about my Mega Vivarium and some of the new succulents I've gotten! A lot has changed. Under the leaves in the above picture, there are various mosses and some other organisms. I water this area almost every day and it is always damp and humid under the leaves, this makes a good habitat for most decomposers. 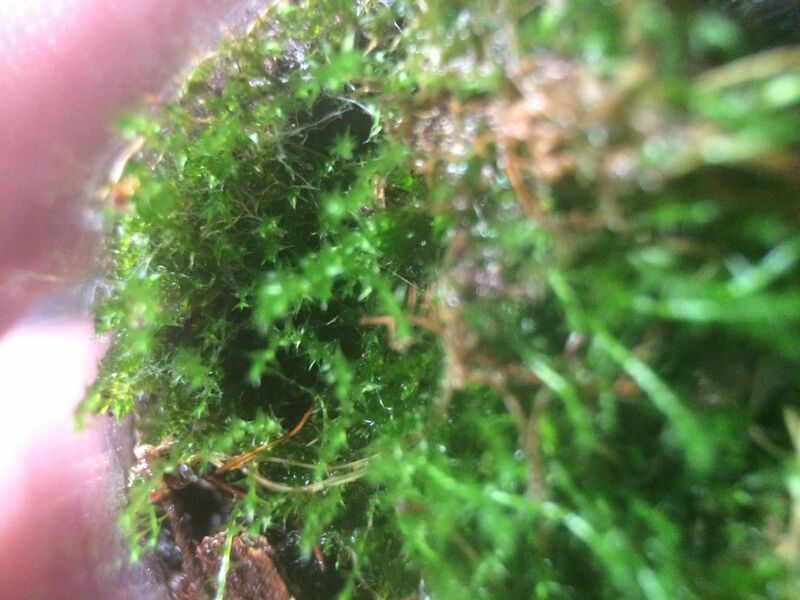 While I introduced these mosses, I noticed a very fast small centipede, a new species of springtail, and a new species of mite. 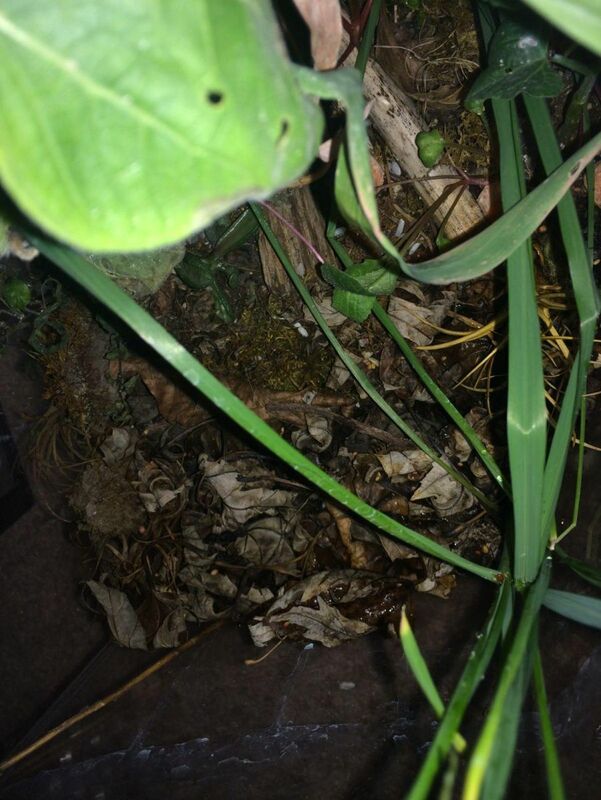 isopods are also hiding in this leaf litter, and eating some of it. 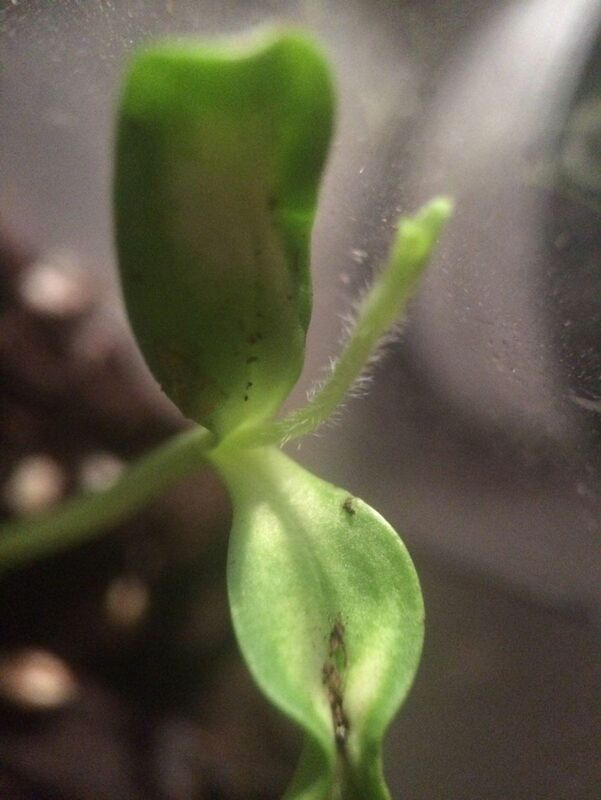 On the succulent in this picture, I have introduced a species of tropical aphids. I figured it would be just fine since the plant is already starting to die anyway, and it's just a small population of maybe a dozen. 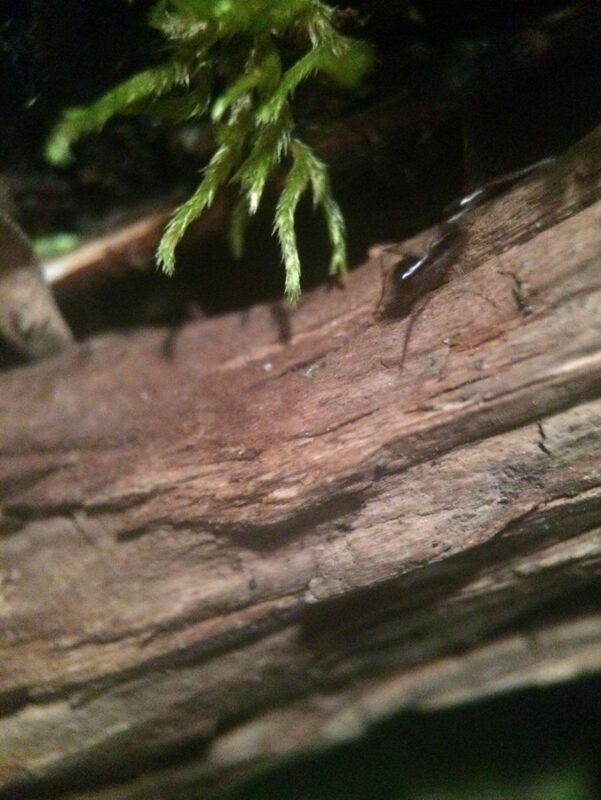 Below will be some pictures of under the leaf litter. 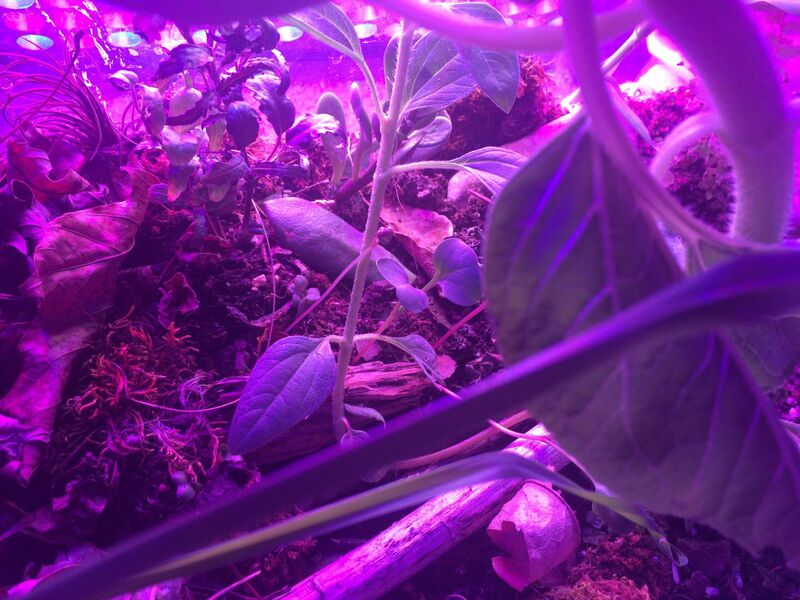 Below are some pictures of other plants. I think this oakleaf fig will grow in, it's already starting to wrap around other plants. 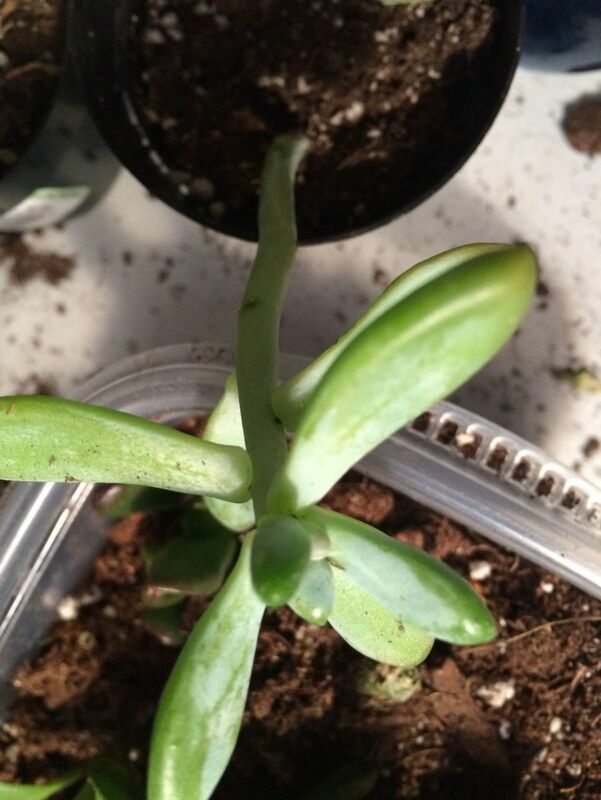 Now we'll move onto the succulent section! 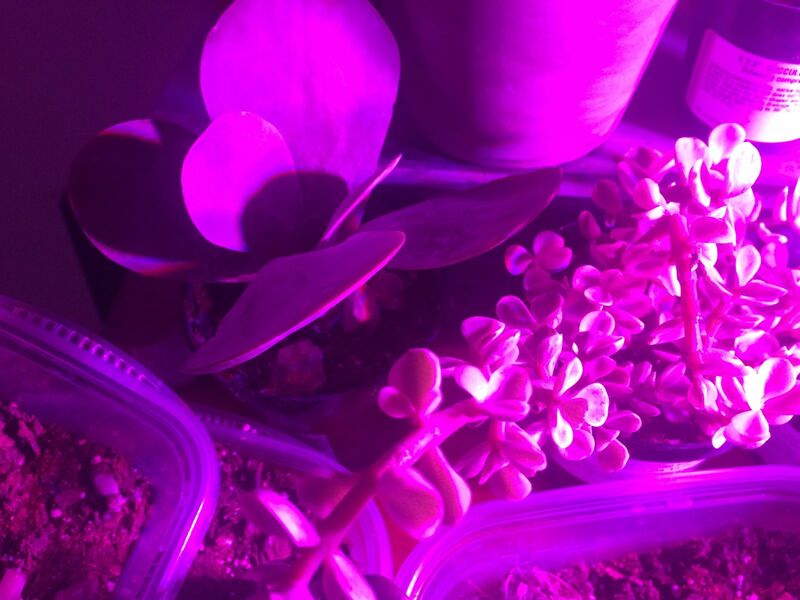 These 2 plants are Kalanchoe and elephant bush, they're really large and interesting. 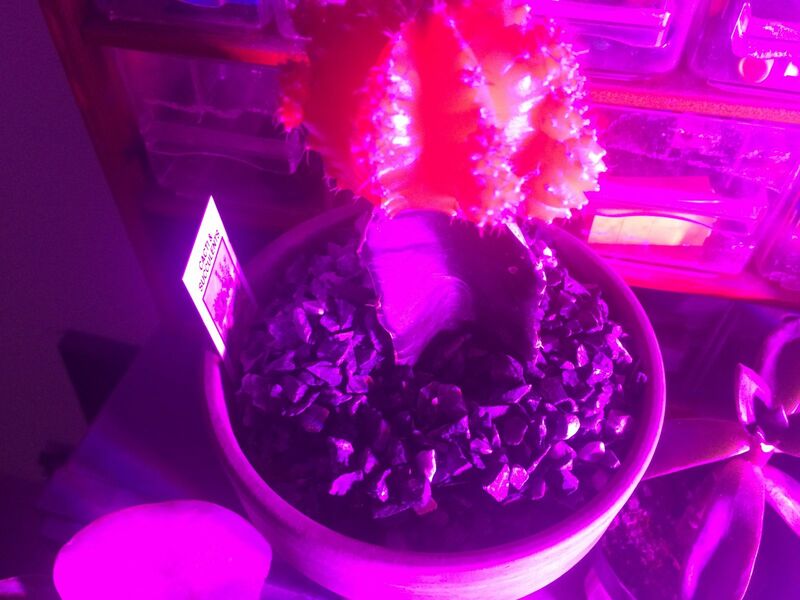 Here's a really cool cactus! 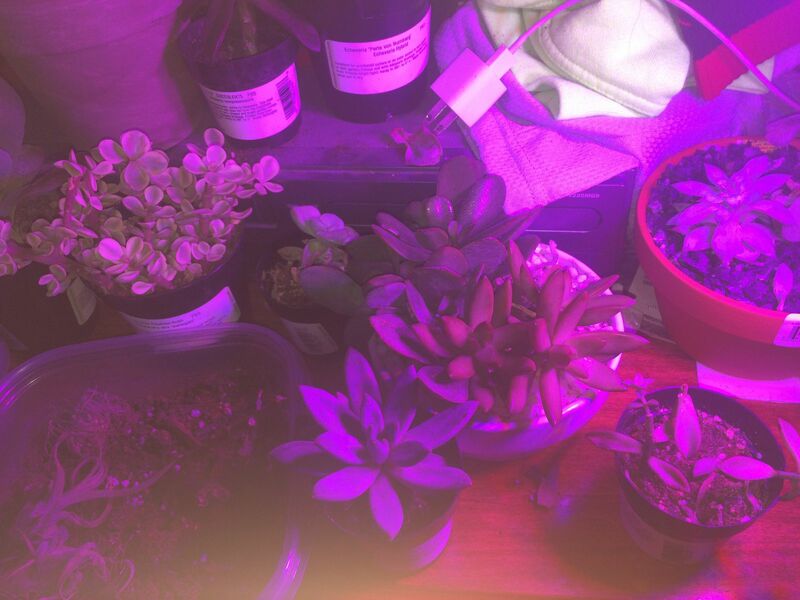 In this picture you can see Echeveria, Sedum, Pachyveria, Kalanchoe, Crassula, and an unidentifed plant. I'll probably update in the next few weeks. I'm guessing that in March and April, there will be lots more action. The ants still havent made much appearance, and I've added 2 Solenopsis molesta queens to the Mega Vivarium. I'm starting to really like Microbiology, and I'm probably going to start a springtail/mite/microbiology journal, instead of including it here. It's been almost a month since I updated this, and the plants in the Mega Vivarium have really grown! But I want to show some of my other setups, too. 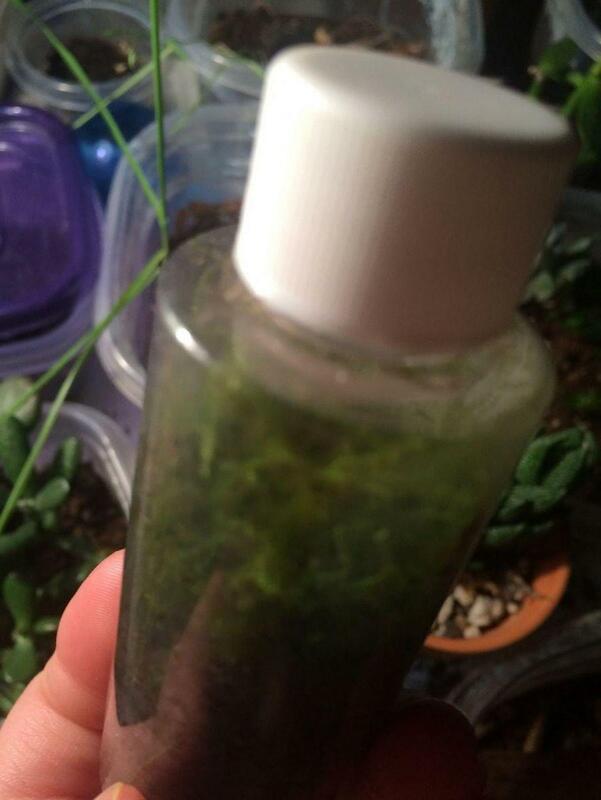 Here is my vial terrarium. This moss has been in here since September, and it looks like a jungle now. Here are some of my propogations of sedum, crassula, echeveria, and possibly more. 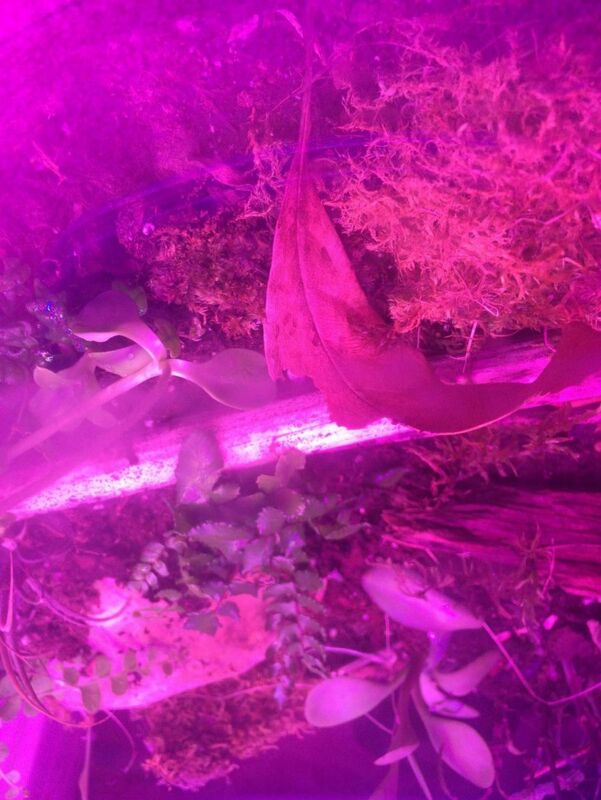 Here are some pictures of the mega vivarium. 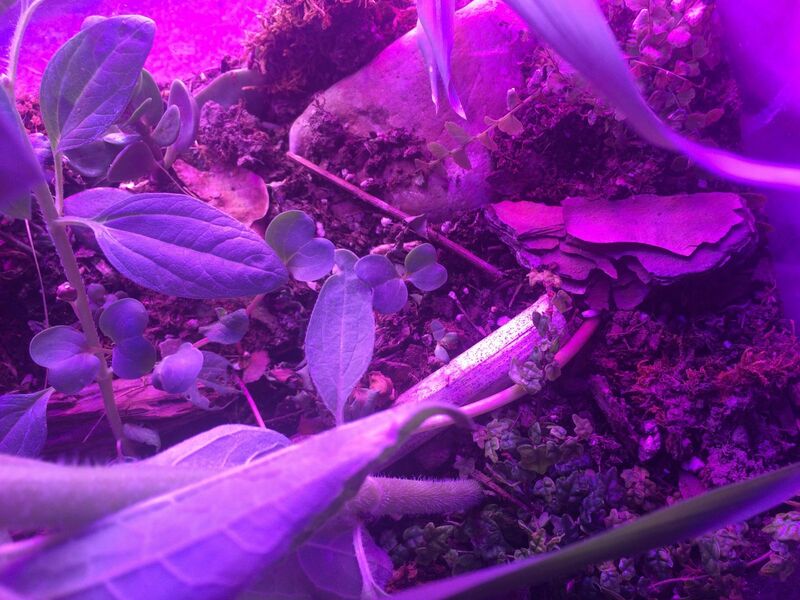 You can see the plants are growing like crazy! Here's the oakleaf creeping fig, which has, well, started creeping! Here's a video of the large population of Folsomia springtails in a very small area... Feasting and breeding! Unfortunately I still haven't seen any of the ants again. Hopefully they emerge from their hibernation soon! I threw in a dead Tetramorium immigrans queen a long time ago as food for mites. Because apparently there is now a colony of them dominating the right half of the vivarium. However, the Formica cf. 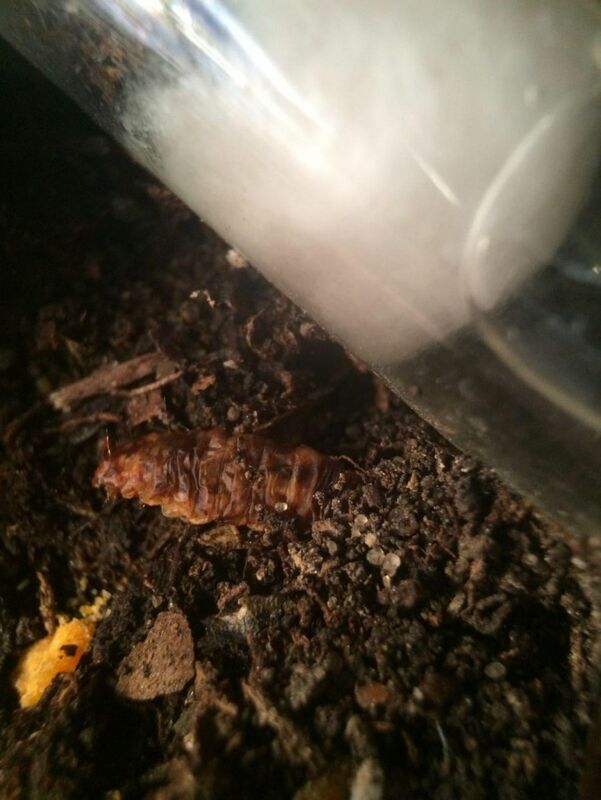 incerta has been very active now, and has eaten a cricket and some sugar water. There's also a lot of wildlife thriving, there's countless species of mites and springtails, which are almost all unable to be identified down to a species level with my experience. 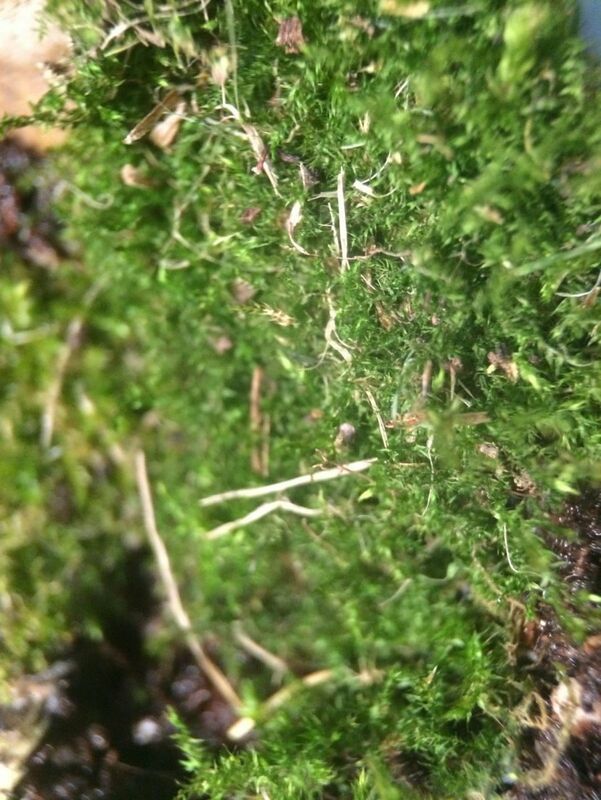 I got videos of the traffic of a piece of rice next to the moss. 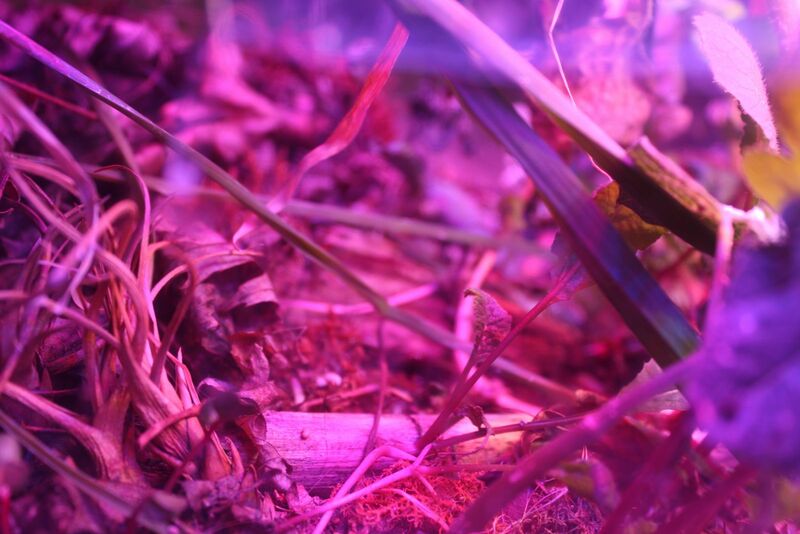 In the background of this video, you can see a Tetramorium worker. 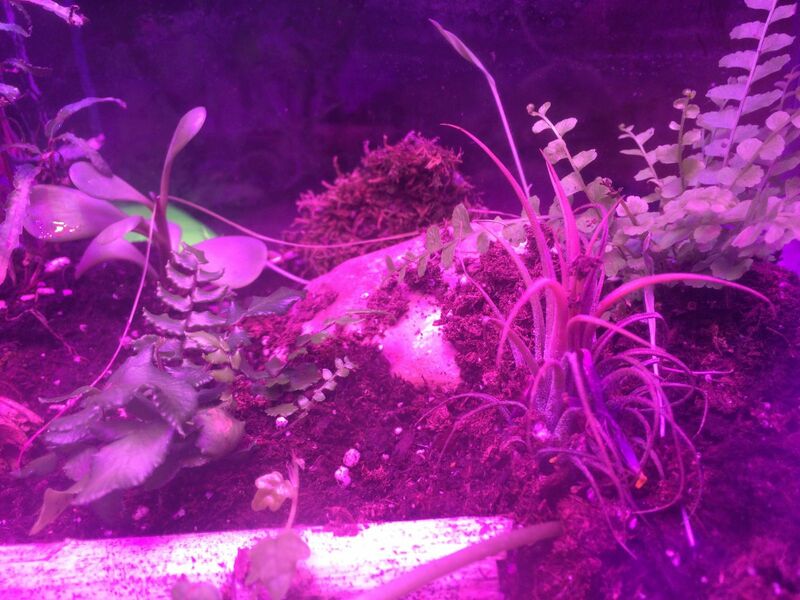 Some of the plants are just not thriving in this terrarium, and dying off. 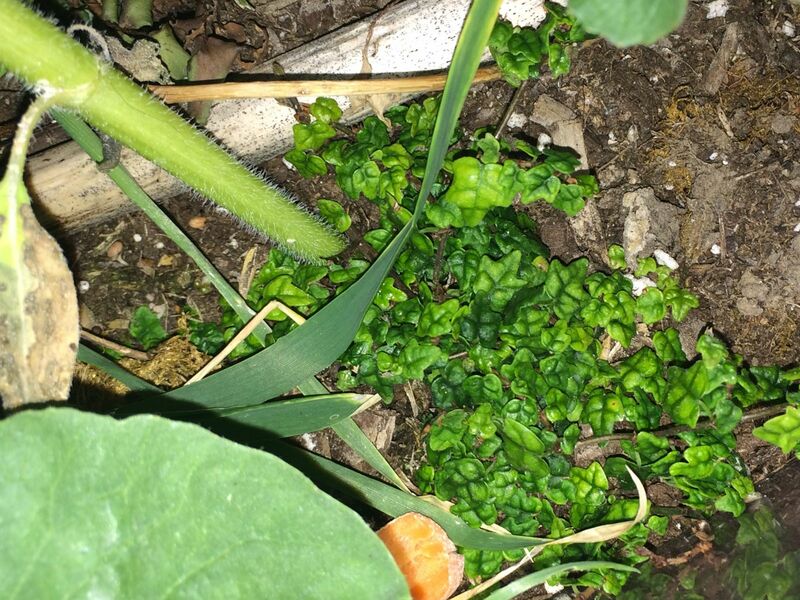 However, the tall plants and the creeping fig are growing. 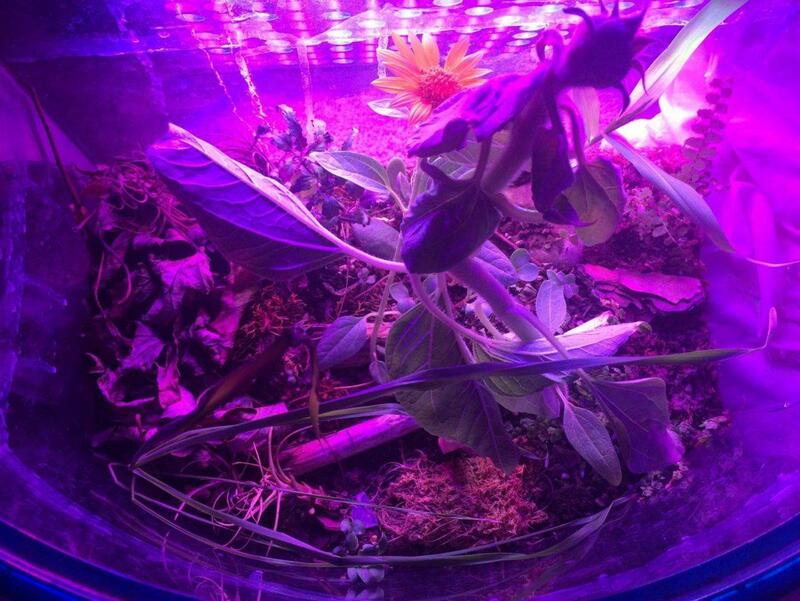 I also added seeds for other plants. Sorry for some bad angles and quality, this thing is huge and it's hard to catch everything. The Tetramorium have decided to nest right next to where the piece of rice was filmed in the last video, under the moss. Probably for moisture. The Formica nest is a good 6 inches away, under a wood chip in the rough and plant-covered terrain, which the Tetramorium tend to avoid. I haven't updated this in about 2 weeks, so I'll be doing so now. 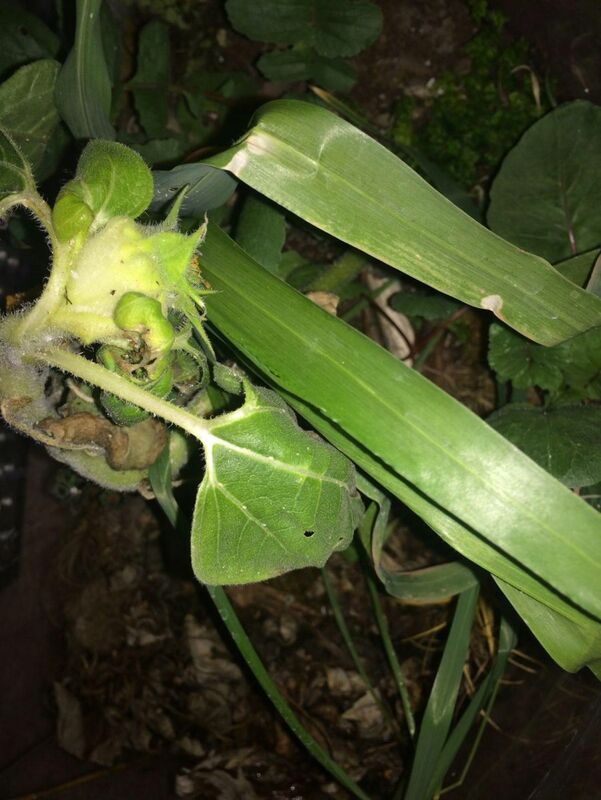 One of the tall plants has flowered, with the larger one following. These tall plants are proving to be a problem to me, but the Formica subaenescens and aphids seem to disagree. The aphids have managed to get to all of the larger plants, so the oakleaf fig and the ferns have been untouched. 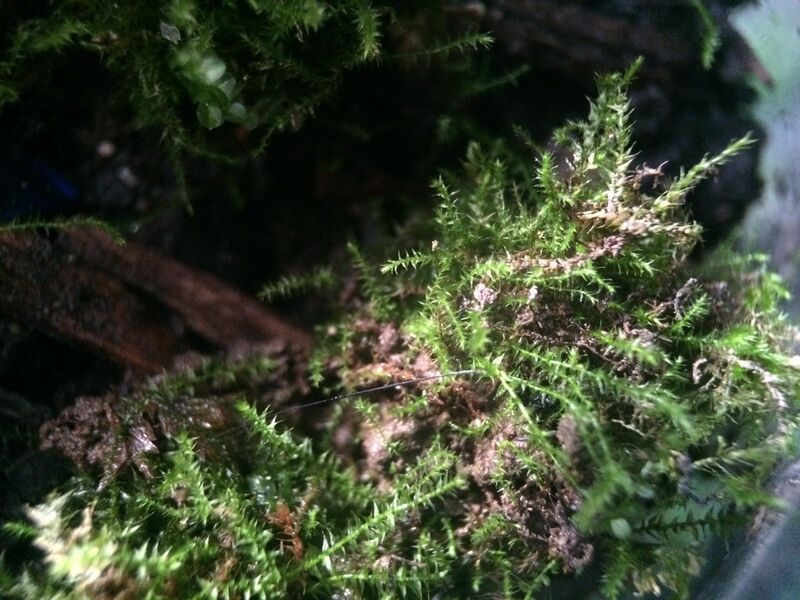 However, the ferns seem to be dying. The oakleaf creeping fig is thriving. 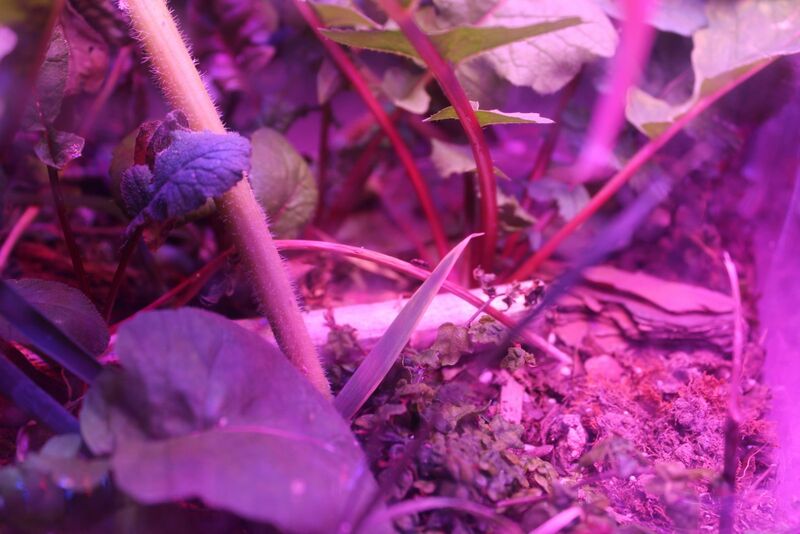 The aphids are almost always getting attention, and it seems as if the ants think that there just Must be something beyond this vivarium, and the plants are the gateway. 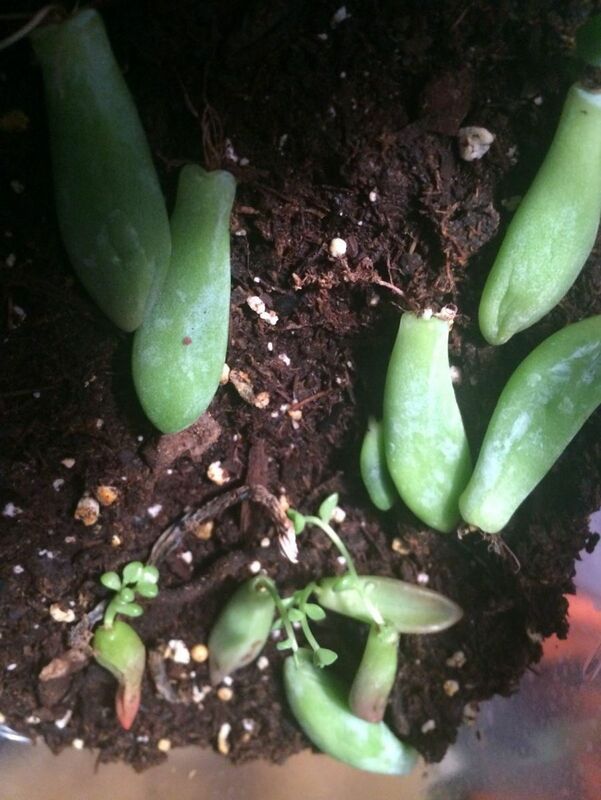 They came into this vivarium from the succulent that was planted, and obviously, they have spread from that. I found one of the aphids on a leaf, and it was the largest I've ever seen, measuring 4 mm. The slugs have obviously been thriving, as I can almost always see them eating the rice, and leaves on the bottom of the tall plants. I see 3 main species of springtails, the ones I see in the open most are Folsomia candida, next is some sort of Lepidocrytus, and then some sort of Pseudosinella. The Tetramorium seem to be spreading towards the Formica nest, but still do not go into it, as they poke around the entrance and wander off. 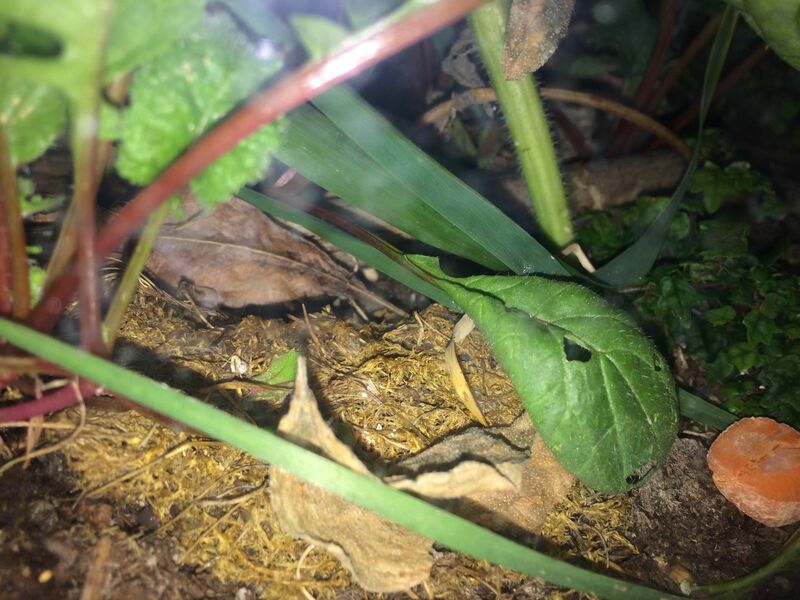 However, when I placed a centipede in front of the Formica nest, it was evident that the Tetramorium would go anywhere for food. I took it away and gave it to the Formica when they became more active. I'm hoping the oakleaf creeping fig will spread across the whole terrarium, as it will create a pretty cool ground cover. Here are the leaves that the slugs munched on. Sorry for shakiness. Will update later, of course. 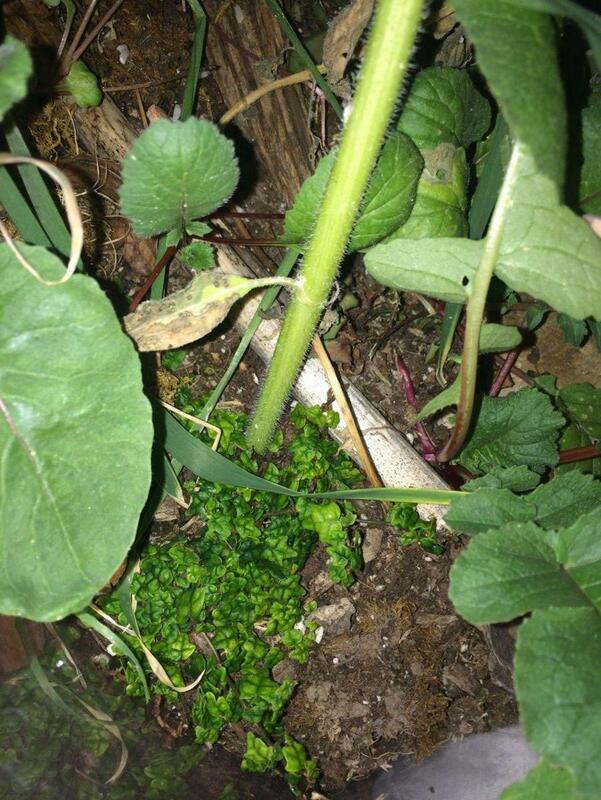 The slugs seem to think they should climb to the top of plants and eat all their leaves! 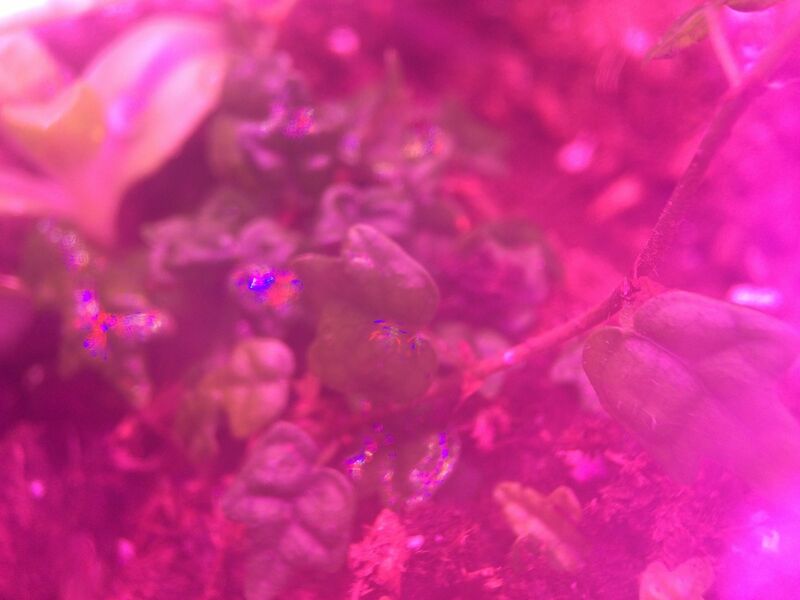 I definitely need a predator, all the plants are being affected. I'll update more in depth soon. In your Jan 13th update, you show a cactus. Just FYI, that cactus is actually 2 different ones grafted together. 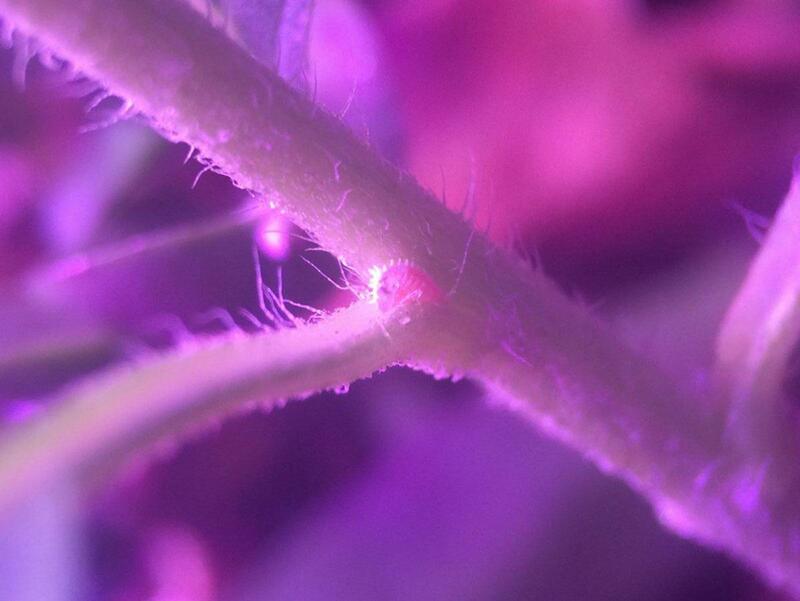 If you remove the top red part, the bottom will begin to grow a side shoot. This lower stem is actually Dragonfruit cactus. 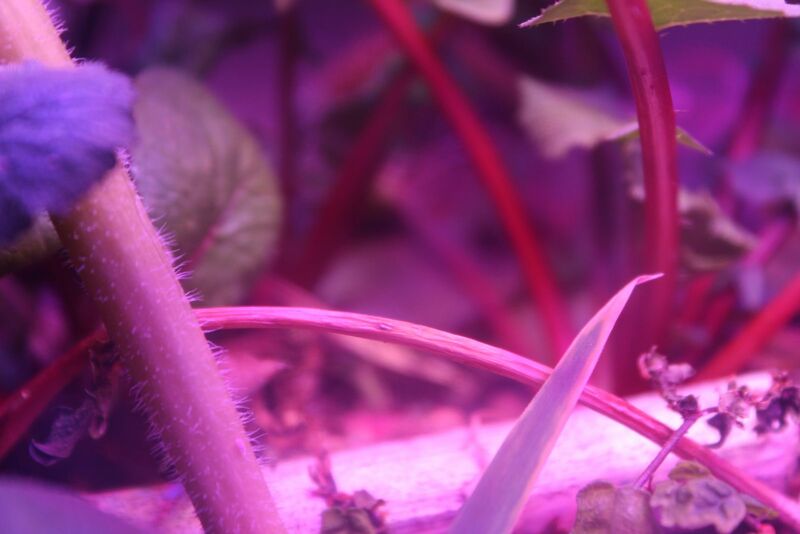 They use them because they grow quickly from cuttings and take readily to grafting. I was planning on purchasing a couple and trying to grow them out. I have not seen the Formica subaenescens in the vivarium in a few weeks. Not even a worker. This worries me and makes me think something killed them. 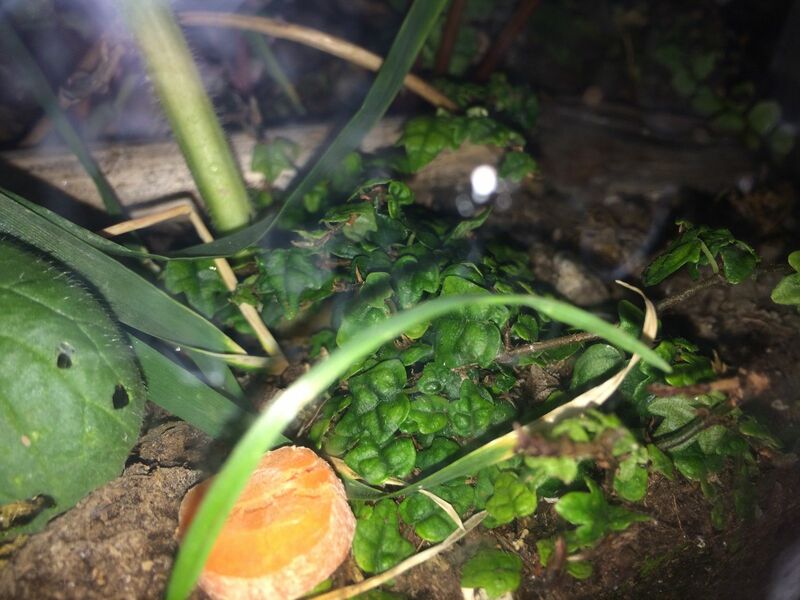 I threw in some carrot for the isopods, slugs, and springtails. They liked it, but so did the Tetramorium colony. In an effort to keep the Tetramorium population low so that they don't kill other species, I introduced a large red mite. These mites can live over a year. I have seen it kill only 1 worker so far, but I bet it has done more when I am not looking. The large, tall plants have flowered and come to the end of their lifetime, so the mealybugs take to the other plants. 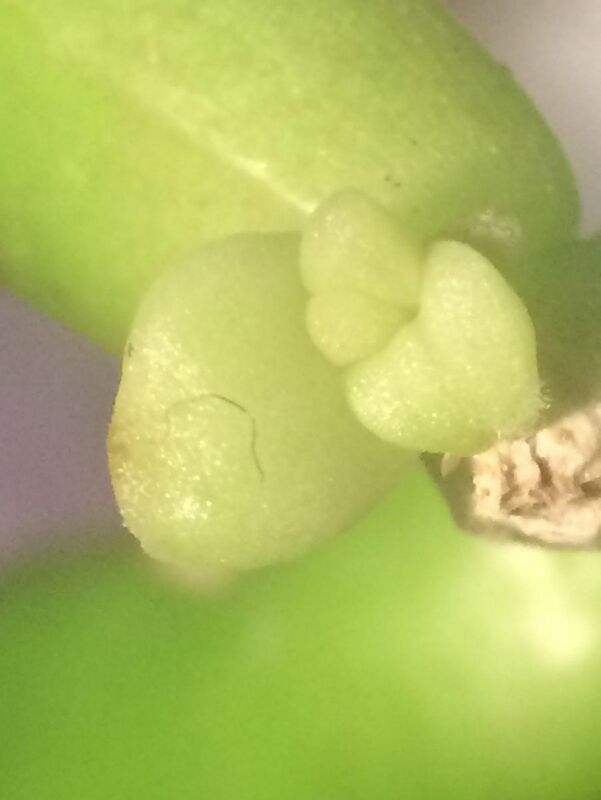 It seems the mealybugs have bred because there's now ~100 adult and small, newborn mealybugs in the vivarium. 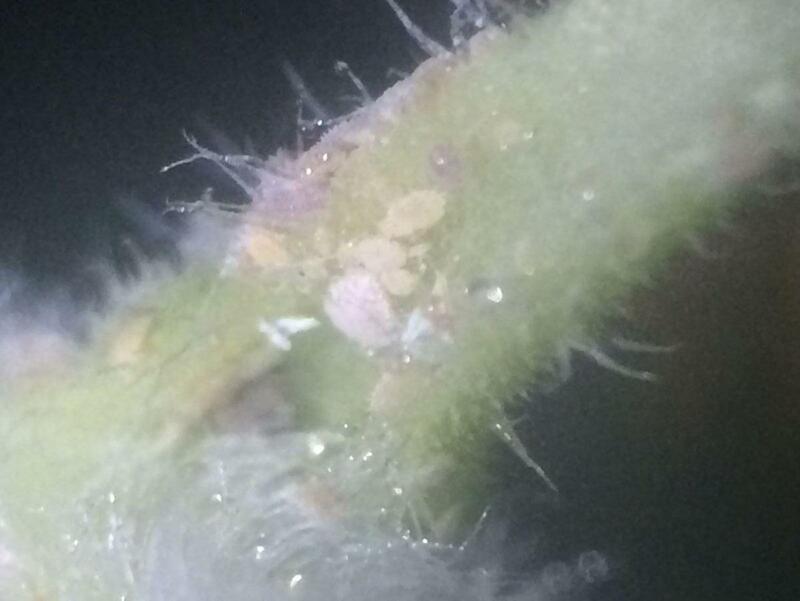 The mealybugs are actually Plannococcus citri. 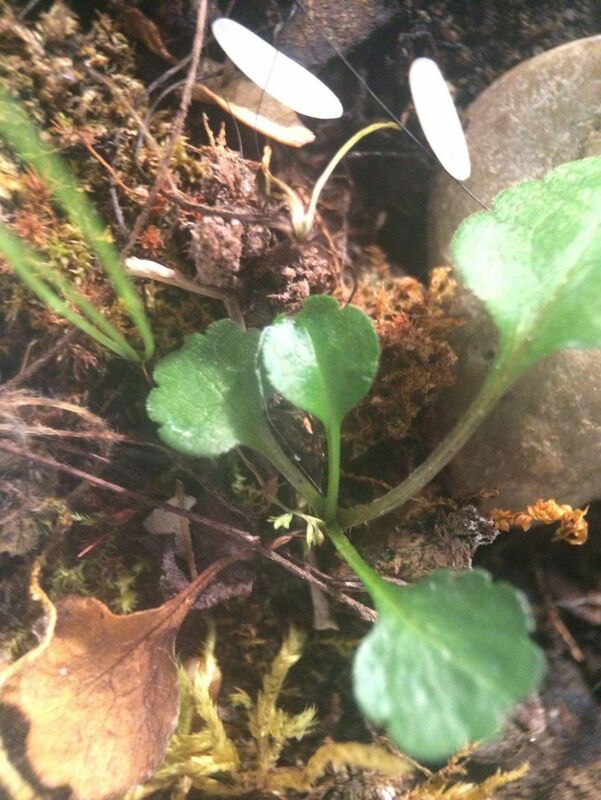 They're known for being on citrus plants, but in my vivarium they're on the grass, succulents, radish, small bean plant, and even the small, unknown plant. The oakleaf creeping fig seems to be living up to its name, creeping around the moss, and also over the stick. Aside from the large red mite, there is a Myrmica queen that would not cooperate with me in her test tube setup. 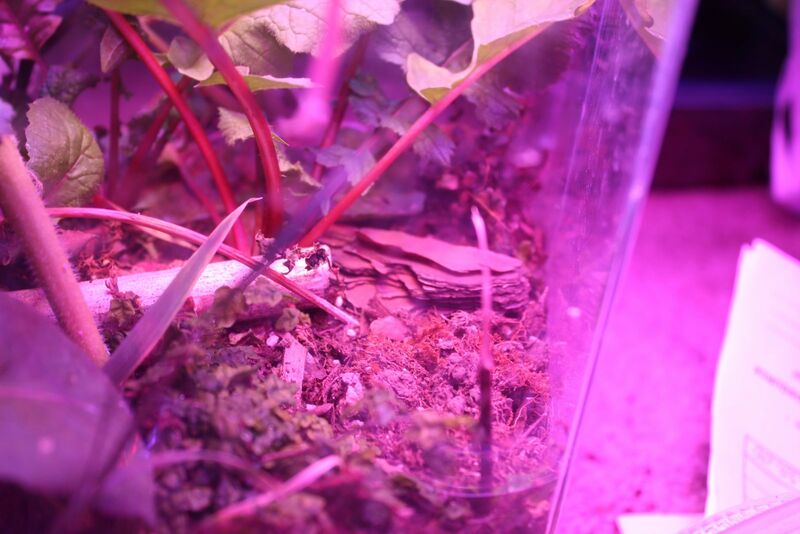 I introduced her into the vivarium, and she started digging within an hour. I often see her foraging. I've seen no trace of the Lasius queen I introduced at the start of this vivarium. This is a concern for me. The unintentional introduction of Tetramorium seems to be the only introduction that has led to a thriving colony, so I need something that will kill them off and then still keep the balance of the vivarium. If you have any suggestions, please tell me. 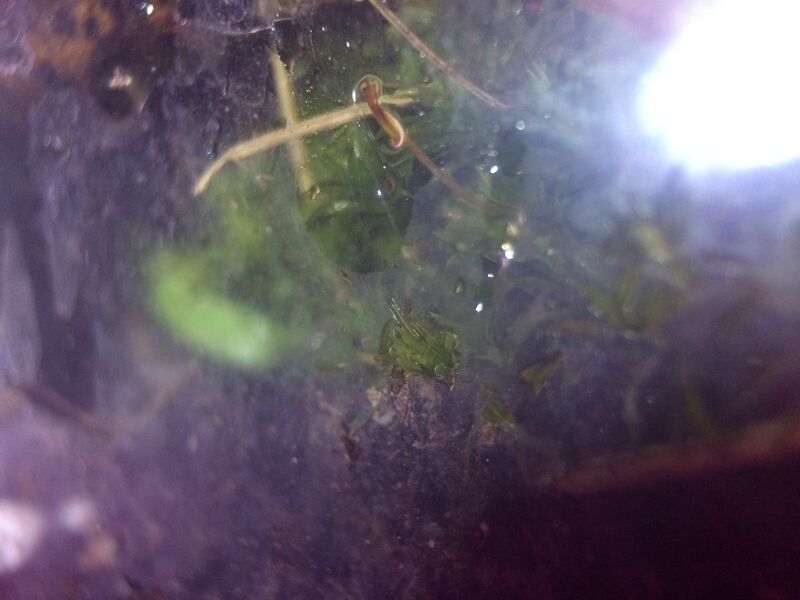 I wasn't able to find where the Myrmica queen dug at first, but while taking pictures I noticed her go into a small hole under the moss. She didn't emerge for a few minutes. 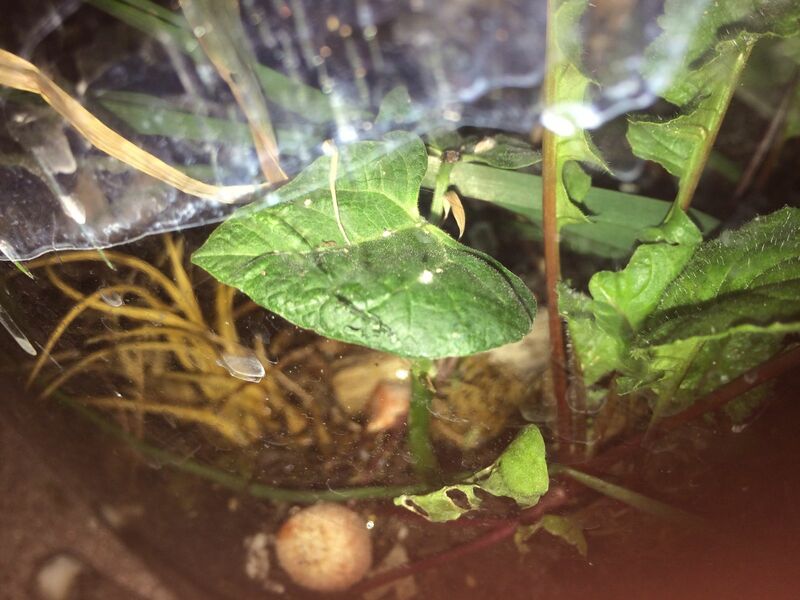 The isopods seem to be very active when I put in carrots and rice, and after I water the vivarium. 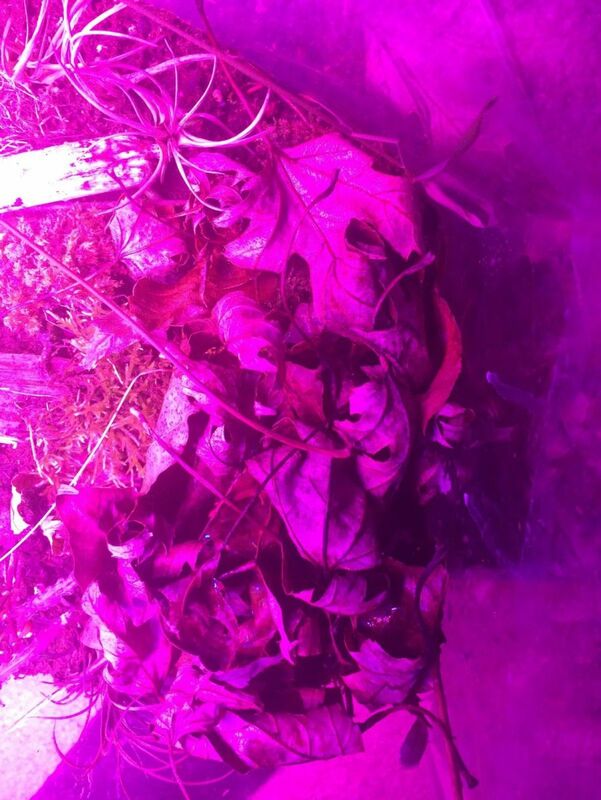 As the vivarium dries, they stick to the leaf litter for the next few days, until it's watered again. 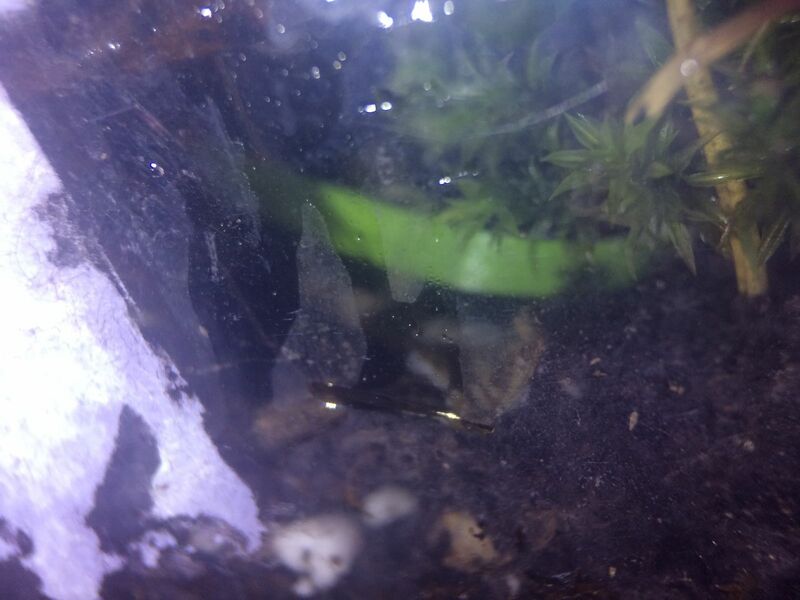 Sorry about the terrible filming, they're underground and algae seem to have grown all over the glass in that area. TURN THE VOLUME OFF! I tried to get rid of the terrible noises but I edit it out and youtube decides it's still there. Edited by AnthonyP163, April 7 2018 - 8:14 PM. 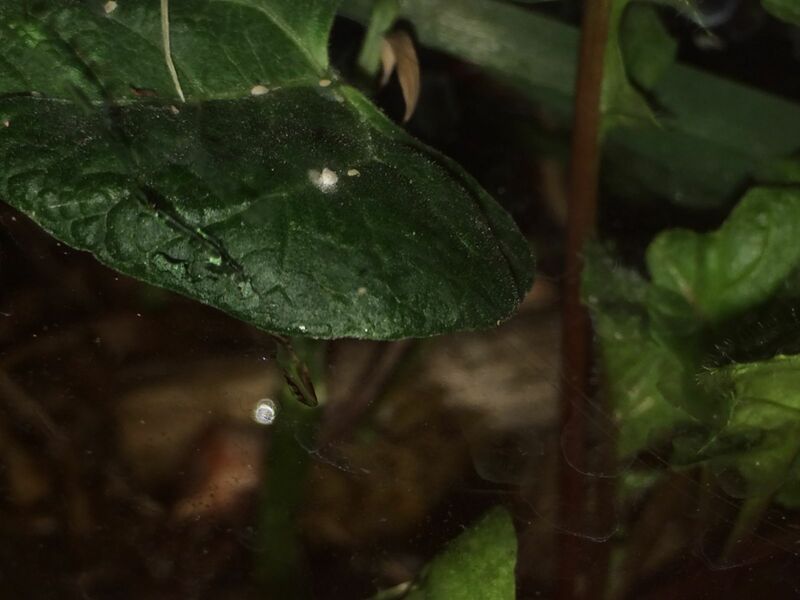 Since the queen died in my Crematogaster journal, I have decided to introduce the remaining 8 workers and eggs into the vivarium. Right away, they came in contact with a Tetramorium worker. The Crematogaster ended up scaring it off, which tells me that there won't be any problems with them getting attacked. They even immediately took over the piece of carrot that the Tetramorium used to go to. 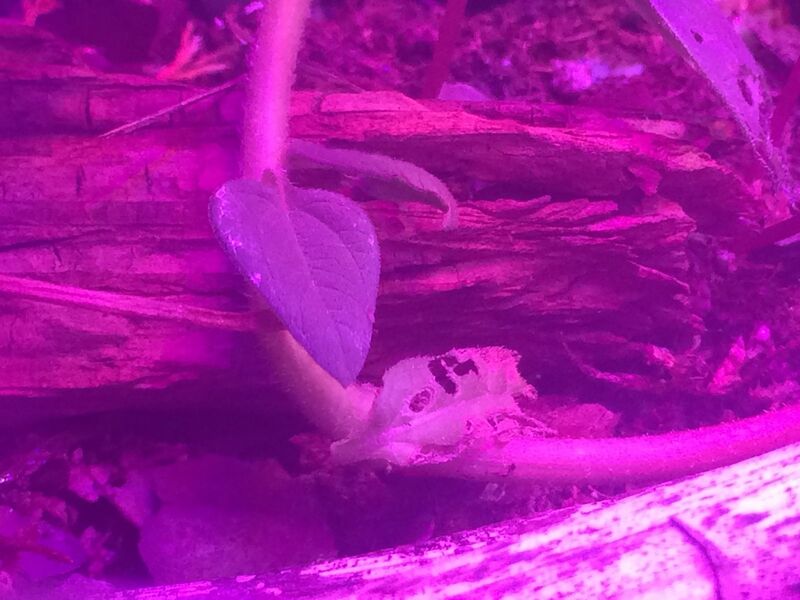 Hopefully, the Crematogaster will interact with the aphids and maybe hunt some slugs or isopods, as they are starting to grow in numbers. Edited by AnthonyP163, April 8 2018 - 6:28 AM. Great news! I saw a foraging Formica subaenescens worker today! Bad news, I saw a dead Formica subaenescens worker today. Being dragged into the nest by Tetramorium. I'm thankful that they're alive, I'm just hoping that they can stay like that. I really think if I can get rid of the Tetramorium, I can fix the imbalance. The Crematogaster have sure gotten the Tetramorium riled up, I desperately need suggestions to get them out of there. I've only seen a couple Tetramorium workers get killed. Well, the mealybugs are now on literally every plant in the vivarium. I need some sort of biological control method to keep their populations low. I just got my new camera, the canon eos rebel t6. 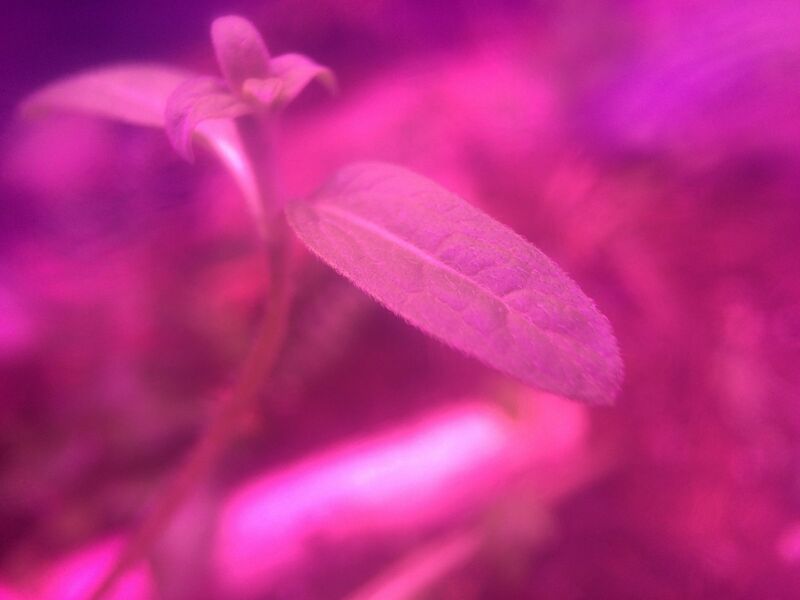 I'll get my macro lens for it soon, but I can still take pretty good pictures of the plants. Here are some!